AmSafe Bridport > News, Media & Events > Cargo > Get the ROI you Deserve! Technology is defined as: “The application of scientific knowledge for practical purposes, especially within industry”. Modern Technological advancement is fast paced, providing ever evolving solutions to both new and pre-existing problems. Each new development presents both unexpected challenges and exciting new opportunities, and so the cycle continues. The aerospace industry is no different. In order for users to achieve IOC and FOC (Initial and Final Operational Capability), new aircraft platforms provide brand new hurdles which must be overcome. New aircraft however, do not appear on the market quite as frequently as many consumer focused products. Therefore, maximising the potential of the most capable pre-existing platforms has become of paramount importance within regards to technological development. The NH90 is a perfect example. AmSafe Bridport also provides cargo restraint and protection across a range of other rotary wing platforms (e.g. Chinook, Puma/cougar, AW101, V-22, etc.) and fixed wing platforms (e.g. A400M, C-130, C-17, C-295, CN-235, etc.). 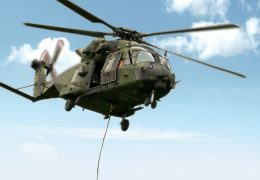 Users have also procured some of this existing equipment to use with the NH90 to tackle their other operational demands and maximise their return on investment. “Transport helicopters are a key capability for the Military, in order for them to use these assets to the full it is vital they have cargo restraint and cargo protection equipment that is safe, reliable, and supported, we have been delighted to support these Nations in their efforts to improve their operational capability and efficiency.” – said Joe Ashton, Cargo Business Unit Manager for AmSafe Bridport.